excipients: microcrystalline cellulose, magnesium stearate, talc purified, aerosil 200. Beta adrenoagonists with a predominant effect on beta2-adrenergic receptors (localized, particularly in the bronchi, myometrium, blood vessels). Prevents and reduces or eliminates bronchospasm, reduces the resistance in the airways, increases the vital capacity. It prevents the release of histamine, slow reacting substance from mast cells and factors chemotaxis of neutrophils. Compared with other drugs of this group has a less pronounced positive chrono-and inotropic effect on myocardium. It widen of coronary arteries, practically does not reduce blood pressure. Has tocolytic effect, lowering the tone and the contractile activity of the myometrium. 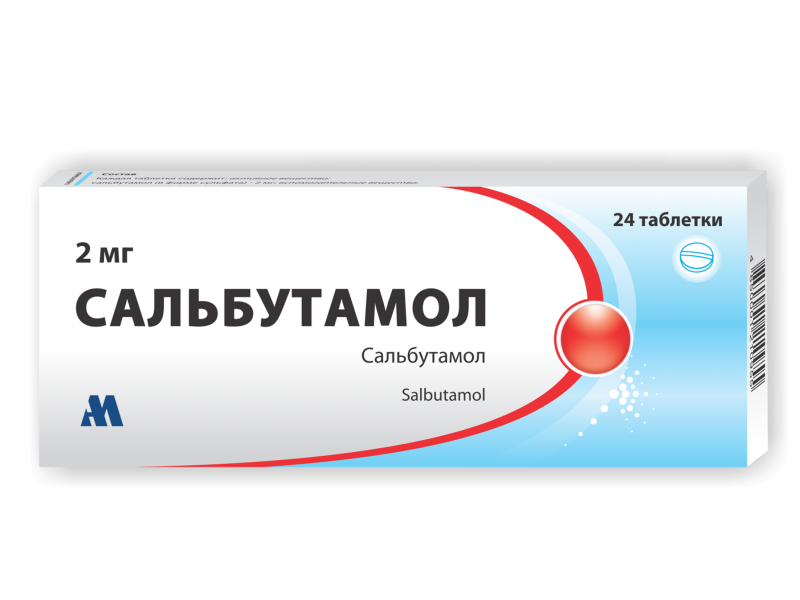 Salbutamol is readily absorbed from the gastrointestinal tract. It is subject to first-pass metabolism in the liver and possibly in the gut wall; the main metabolite is an inactive sulfate conjugate. Salbutamol is rapidly excreted in the urine as metabolites and unchanged drug; there is some excretion in the faeces. Salbutamol does not appear to be metabolised in the lung, therefore its ultimate metabolism and excretion after inhalation depends upon the delivery method used, which determines the proportion of inhaled salbutamol relative to the proportion inadvertently swallowed. It has been suggested that most of an inhaled dose is swallowed and absorbed from the gut. The plasma half-life of salbutamol has been estimated to range from 4 to 6 hours. Salbutamol is used as a bronchodilator in the management of reversible airways obstruction, as in asthma and in some patients with chronic obstructive pulmonary disease. Generally treatment begins with the application of salbutamol inhalation form. When inhalation is ineffective, Salbutamol may be given inside. Adult and children over 12 years: 2-4 mg every 6-8 hours , if necessary, the dose may be increased to 8 mg every 6-8 hours. Children aged 6 to 12 years: 2 mg every 6-8 hours. Children aged 2 to 6 years: 1-2 mg every 6-8 hours. Elderly and sensitive patients are administered at an initial dose of 2 mg every 6-8 hours. Nervous system: tremor, inner trembling, tension, headache, dizziness, sleep and behavior disturbances, muscle cramps. Cardiovascular system: palpitations, tachycardia, arrhythmias, peripheral vascular dilatation, ischemic heart disease. Allergic reactions: rarely – paradoxical bronchospasm, urticaria, angioedema, hypotension and collapse. Other: Potentially serious hypokalaemia has been reported after large doses. Salbutamol should be given with caution in tachyarrhythmias and other cardiac arrhythmias, arterial hypertension, myocarditis, heart defects, aortic stenosis, diabetes, thyrotoxicosis, glaucoma, acute heart failure (with careful medical supervision). Increasing the dose or frequency of receiving salbutamol should be under the supervision of a physician . Shorter interval is possible only in exceptional cases and should be strictly justified. In severe forms of asthma salbutamol should be used in combination with other drugs. In severe asthma particular caution is also required to avoid inducing hypokalaemia as this effect may be potentiated by hypoxia or by concomitant use of other anti-asthma drugs; plasma-potassium concentrations should be monitored. – Children under 2 years old. Salbutamol is contraindicated in threatened miscarriage in I and II trimesters of pregnancy , premature birth , multiple pregnancy , heart disease in pregnant women, eclampsia , pre-eclampsia , intrauterine infection, fetal death in utero. It is known whether Salbutamol is distributed into milk, so the prescription of salbutamol during lactation should decide on the termination of breast-feeding. Use of salbutamol and other beta2 agonists with corticosteroids, diuretics, xanthines or in the presence of hypoxia increases the risk of hypokalemia. Salbutamol and non-cardioselective β-receptor blocking medicinal products should not usually be prescribed together, because possible mutual suppression of therapeutic effects. Simultaneous precipitation of theophylline increases the risk of tachycardia and arrhythmia , in particular, supraventricular arrhythmia. White, scored cylindrical tablets, the end surface of which are flat. Cardboard box containing 24 tablets (1 blister packet with 24 tablets).